John Horvat II would love to speak to your parish or conference and share his passion for America’s Return to Order. The incredibly unique solutions he discovered in the course of two decades of research are refreshing and hopeful. His ability to pinpoint the root cause of our economic and moral crisis and communicate the benefits of an Organic Christian Society has lead him to speaking engagements at home and abroad, including Austria, Brazil, France, Germany, Ireland, Poland and South Africa. Improve your capacity to deal with the present economic and moral crisis. Strengthen your conviction that America is worth fighting for. Lower your anxiety over the lack of economic solutions. Enhance your ability to reconnect with our Christian roots. Renew your resolve to fight for what is good in America. Boost your enthusiasm for a society with Christ as its Model. His articles and guest appearances have been featured by ABC News, C-SPAN, The Wall Street Journal, FOX News, The Christian Post, The Washington Times, CBS News, USA Radio Network, TheBlaze, Conservative HQ, the Associated Press, Tea Party News Network and in many other news media. 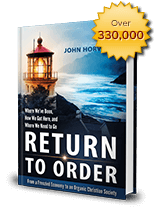 Whether its a men’s retreat, parish event, or conference, John Horvat is a dynamic and engaging presenter who will inspire your audience. For information on how to book him for your event, please contact us. You can also contact Mr. Horvat directly at: jh1908@aol.com. Description: A talk that focuses on what it means to honor parents, why your whole family needs to be fired up with the idea of honor, and how the sense of honor can revitalize society. Description: So many talk about the abuses of big government but few speak about what makes government big and what can be done keep it small. This talk addresses these subjects and lists five steps one can take to return America to its roots and limited government. Description: The key to confronting the nation’s problems is to understand them. This talk provides an penetrating analysis of today’s frenzied lifestyles and markets and what can done to remedy these problems. Description: An outline of what is meant by an organic Christian society and how such a society based on Christian wisdom would provide remedies for some many of today’s social and economic problems. Description: This talk describes a culture of instant gratification that is leading to an economic crisis and what concrete steps might be taken to create a contrary culture rooted in family, community and faith. Description: This talk looks at the moral dimension of the present social and economic crisis and discusses the need to return to a Christ-centered vision of society that embraces suffering and self-sacrifice. 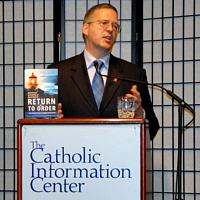 Mr. Horvat can also speak about or adapt the many themes contained in his book, Return to Order, to suit a specific audience. “I wanted to thank John Horvat II for speaking at our Catholic Business Breakfast. His address was spot on and everyone who came to the Harbour Club that morning was delighted.